First-time release of Frey Organic Tannat! Available online. 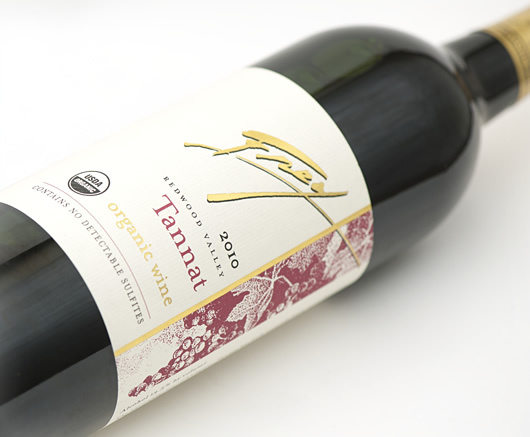 For those of you who love a rich, full-bodied tannic wine, you must try our Organic Tannat! It is rarely found in the U.S. today. We like it because of its intense fruity mouth-feel, sumptuous tannic structure and spicy finish. The 2010 production is limited to just 180 cases and Frey Wine Club members will enjoy a pre-release bottle with their April shipment. For more information about our Wine Club that offers specialty wines and year round discounts, please check here. We planted one-acre of Tannat in 2007 and it’s been a thrill to work with this new grape. Tannat berries are thick-skinned and inky colored. It’s one of the most tannic grapes available, similar to a heavy Cabernet or Syrah. The color and depth of the resulting wine is impressive and the flavors are heightened with exposure to French Oak and some aging. Tannat’s homeland is in the Basque region of southwest France in the appellation of Madiran near the Pyrenees Mountains, grown since the 17th century and highly prized. It is also the national grape of Uruguay and called Harriague by the Uruguayans, and the wine is softer and lighter than its French and American counterparts. Tannat was first introduced to the US in the late 1800’s by the University of California at Berkeley and was primarily used as a blending grape for Meritage blends, Cabernet Sauvignon and Sangiovese. 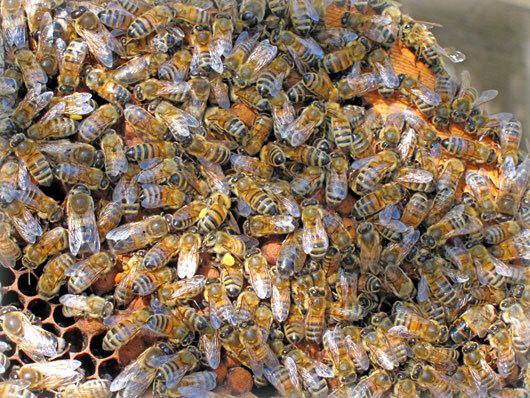 It is now grown in California, Arizona, Virginia and Oregon and gaining increased notoriety as its own varietal. We look forward to many delicious vintages of this unique wine to come. Millésime Bio organic wine convention hall in Montpellier, France. 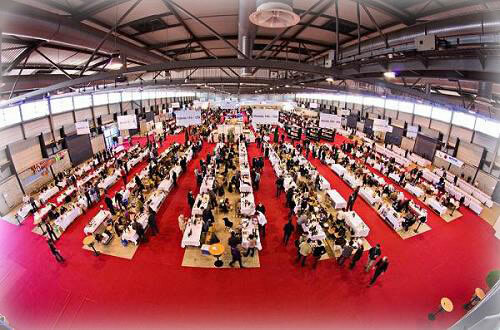 We look forward to continue our participation in this event, to share notes and collaborate with more European winemakers as their non-sulfited wine movement expands. Check out this video from Millésime Bio 2012, including a short interview with Katrina Frey at the end. The practice of infusing wine with herbs goes all the way back to ancient times, and today it’s still a fun and tasty way to enjoy and enhance the flavors of your favorite wines with the benefits of herbal extracts. Organic white and red wine infused with herbs. Herbal infused wines have a long history throughout the world. The Egyptians used wines as a carrier for herbal remedies. Scientists from the University of Pennsylvania analyzed ceramics from Egyptian wine containers and found herbal residues dating back to over 5000 years ago! The herbs they identified included lemon balm, coriander, sage and mint. In tenth century Europe, Saint Hildegrad Von Bingen recommended herbal infusions in wine and vinegar for a variety of ailments from weak heart to congestion. 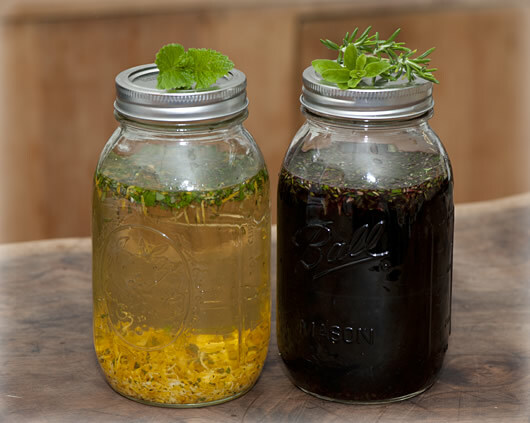 Many contemporary North American Herbalists recommend wine infusions as a simple and enjoyable way to incorporate herbs into your diet. If human beings made herbal infused wines for millenniums, we had to try it too! Infusing a wine is very simple. 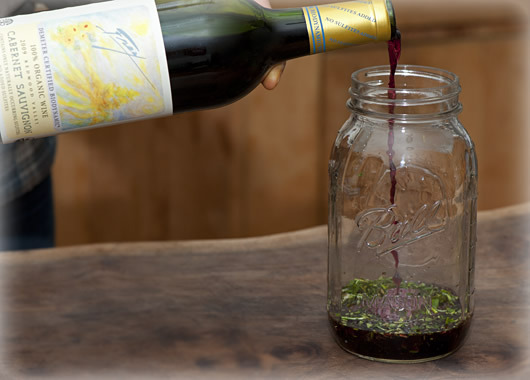 Harvest a small handful of herbs for each bottle of wine to be infused. Make sure the herbs are clean and dry. Roughly chop them and blend together. 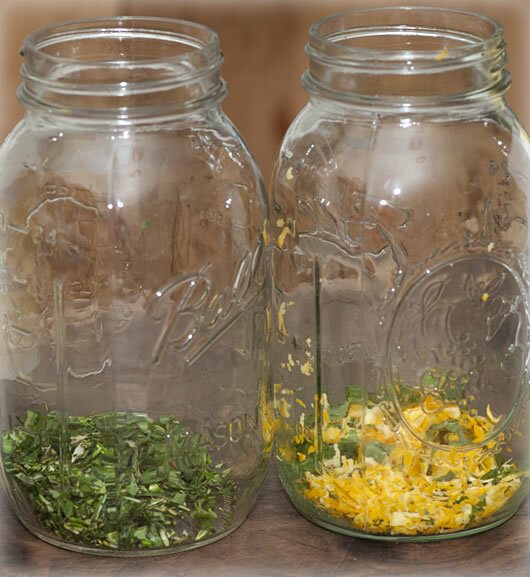 Place herbs in a clean glass bottle or jar and pour in the wine and close lid tight. Let sit for 5 to 14 days. 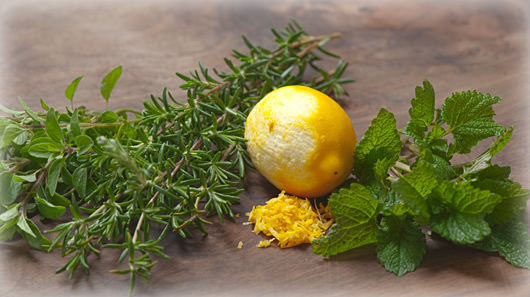 Taste your infusion each day starting on day 5 and when you like the flavor, strain out the herbs and enjoy. You can also pour off a portion of the wine and leave some in the herbs to extract more flavor. Don't overdo it with the number of herbs for each infusion. Keep it simple and find out what you like best. It's simple, healthful fun and the results were wonderfully tasty! Below are more pictures of the steps we took. The herbs laid out, ready for chopping up, and some fresh lemon zest. Oregano and rosemary for the red wine, lemon balm and fresh lemon zest for the white wine. Pouring Frey Biodynamic Cabernet Sauvignon into oregano and rosemary. Five days later, a tasty herbal infusion!